Zeezok Publishing's Z-Guide to Johnny Tremain is a great way to incorporate media into your study of the American Revolution. A silversmiths apprentice turned messenger for the Sons of Liberty Johnny overcomes rejection false accusations and a physical handicap to participate in the birth of a new nation. Run with Johnny through the streets of Boston to deliver the "one if by land; two if by sea" message. Then its off to join Johnny and the Minutemen on Lexington Green in time for the opening shots of the American War for Independence This guide contains a topic overview movie synopsis and ten learning activities for fourth through eighth-grade students. Discover more about colonial apprenticeships the Boston Tea Party and the Battles of Lexington and Concord. Relive the stirring passion of Patrick Henry's "Give Me Liberty or Give Me Death" speech. Expand your vocabulary and understanding of the reasons for American independence while dissecting "The Rights of the British Colonies Asserted and Proved." Memorize a portion of the Declaration of Independence. Get the entire family involved with the "For Family Discussion" section. Coloring pages a crossword puzzle and the Johnny Tremain maze activity round out your study of the fateful events in and around Boston that produced a revolution. Now you can relive those experiences with the Johnny Tremain guide! Movie Summary: A silversmiths apprentice turned messenger for the Sons of Liberty Johnny overcomes rejection false accusations and a physical handicap to participate in the birth of a new nation. Run with Johnny through the streets of Boston calling one if by land; two if by sea. Then its off to join the Minutemen on Lexington Green for the opening shots of the American War for Independence. 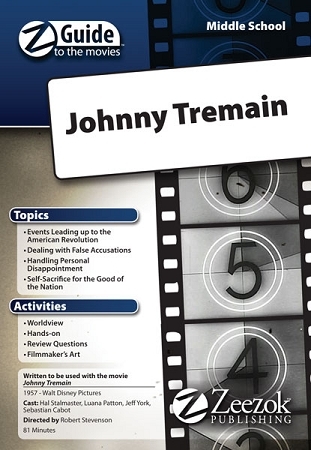 This Z-Guide is based on the movie Johnny Tremain (1957). You can view a trailer for the movie below.